Photosensitized cross-linking of N-acetyl derivatives of tryptophan and tyrosine by rose bengal in phosphate buffer saline was studied by steady-state absorption and emission spectroscopy, nanosecond transient absorption spectroscopy, and chemical analyses. These amino acids undergo cross-linking to form dimeric and higher oligomeric products under anoxic conditions with rose bengal as a sacrificial oxidant, whereas they react predominantly with singlet oxygen produced by rose bengal in aerated solutions. This investigation provides a comprehensive view into the first steps of rose bengal photosensitized cross-linking of these two amino acids. Ludvíková L., Štacko P., Sperry J., Klán P. Photosensitized Crosslinking of Tryptophan and Tyrosine Derivatives by Rose Bengal in Aqueous Solutions. J. Org. Chem. 2018, 83, 10835-10844. The synthesis and photochemical properties of H2S-releasing BODIPY thiocarbamate photocage scaffolds activatable by visible-to-NIR (up to 700 nm) light to release carbonyl sulfide (COS), which is transformed to H2S using either isolated or natural carbonic anhydrase, is reported. The excellent uncaging cross section and high H2S release yields in in vitro experiments, including live-cell imaging, suggest that these photocages can serve as a platform for the bio-orthogonal phototriggered release within the tissue-transparent window. Štacko P., Muchová L., Vítek L., Klán P. Visible to NIR Light Photoactivation of Hydrogen Sulfide for Biological Targeting. Org. Lett. 2018, 20, 4907-4911. Nucleosides, nucleotides and 2′-deoxyribonucleoside triphosphates (dNTPs) containing 5-(hydroxymethyl)uracil protected with photocleavable groups (2-nitrobenzyl-, 6-nitropiperonyl or 9-anthrylmethyl) were prepared and tested as building blocks for the polymerase synthesis of photocaged oligonucleotides and DNA. Photodeprotection (photorelease) reactions were studied in detail on model nucleoside monophosphates and their photoreaction quantum yields were determined. Photocaged dNTPs were then tested and used as substrates for DNA polymerases in primer extension or PCR. Boháčová S., Ludvíková L., Poštová Slavětínská L., Vaníková Z., Klán P., Hocek M. Protected 5-(Hydroxymethyl)uracil Nucleotides Bearing Photocleavable Groups as Building Blocks for Polymerase Synthesis of Photocaged DNA. Org. Biomol. Chem. 2018, 16, 1527-1535. 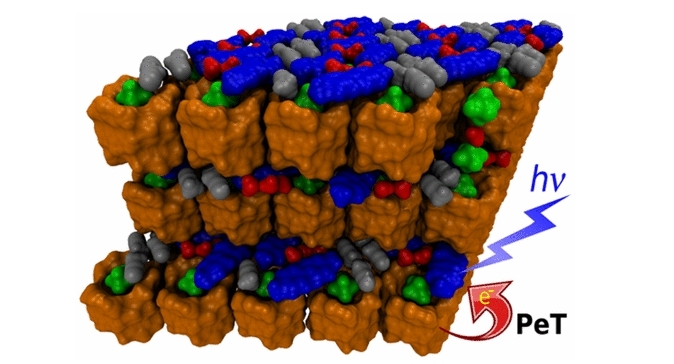 Slanina T. , Shrestha P., Palao E., Kand D., Peterson J., Dutton A., Rubinstein N., Weinstain R., Winter A., Klán P. In Search of the Perfect Photocage: Structure-Reactivity Relationships in meso-Methyl BODIPY Photoremovable Protecting Groups. J. Am. Chem. Soc. 2017, 139, 15168-15175. Vohradská N., Sánchez-Carnerero, E., Pastierik T., Mazal C., Klán P. Controlled Photorelease of Alkynoic Acids and their Decarboxylative Deprotection for Copper-Catalyzed Azide/Alkyne Cycloaddition. Chem. Commun. 2018, 54, 5558-5561. Corrochano P., Nachtigallová D., Klán P. Photooxidation of Aniline Derivatives Can Be Activated by Freezing Their Aqueous Solutions. Environ. Sci. Technol. 2017, 51, 13763-13770. Carbon monoxide-releasing molecules (CORMs) are chemical agents used to administer CO as an endogenous, biologically active molecule. A precise spatial and temporal control over the CO release is the major requirement for their applications. 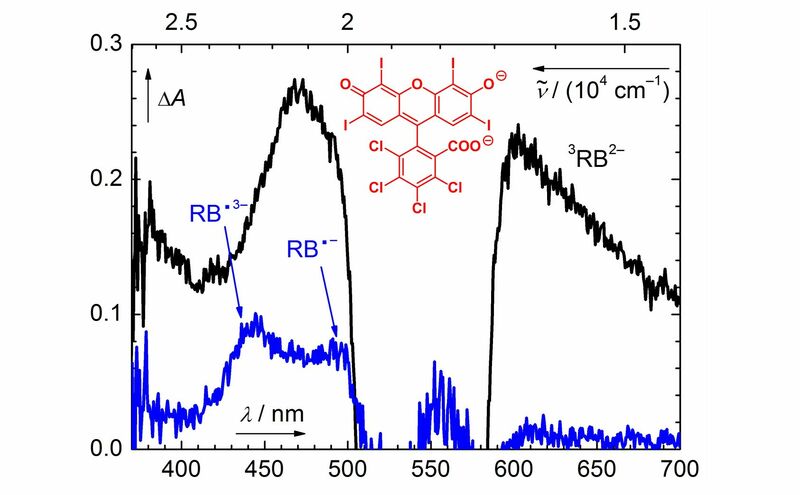 Here, we report the synthesis and properties of a new generation of transition-metal-free carbon monoxide-releasing molecules based on BODIPY chromophores (COR-BDPs) activatable by visible-to-NIR (up to 730 nm) light. We demonstrate their performance for both in vitro and in vivo experimental settings, and we propose the mechanism of the CO release based on steady-state and transient spectroscopy experiments and quantum chemical calculations. Palao E., Slanina T., Muchová L., Šolomek T., Vítek L., Klán P. Transition-Metal-Free CO-Releasing BODIPY Derivatives Activatable by Visible to NIR Light as Promising Bioactive Molecules. J. Am. Chem. Soc. 2016, 138, 126-133.
such as enzymes, neurotransmitters, signaling molecules, fluorophores, insecticides, pheromones, and fragrances that thereby exhibit desirable physical, chemical, or biological qualities upon photoactivation. They are synthetically malleable and accessible, offering a wide range of structures for designed applications. They offer excellent spatial and temporal control for the substrate release. Their applications span many scientific fields, from DNA chip technology, drug delivery, and photoregulation of proteins, to rheology, solid-phase synthesis, surface chemistry, and nanotechnology. PPGs are excellent, versatile tools for time-resolved studies of chemical processes in living cells. Multiphoton excitation can provide superior spatial resolution, and the new chromophores included herein offer more precise temporal control for addressing the dynamics of in vivo events in living organisms. Klán P., Šolomek T., Bochet C., Blanc A., Givens R. S., Rubina M., Popik V., Kostikov A., Wirz J. Photoremovable Protecting Groups in Chemistry and Biology: Reaction Mechanisms and Efficacy. Chem. Rev. 2013, 113, 119-191. Methyl viologen hexafluorophosphate (MV2+·2PF6–) and dodecamethylbambusuril (BU6) form crystals in which the layers of viologen dications alternate with those of a 1:2 supramolecular complex of BU6 and PF6–. This arrangement allows for a one-electron reduction of MV2+ ions upon UV irradiation to form MV+• radical cations within the crystal structure with half-lives of several hours in air. The mechanism of this photoinduced electron transfer in the solid state and the origin of the long-lived charge-separated state were studied by steady-state and transient spectroscopies, cyclic voltammetry, and electron paramagnetic resonance spectroscopy. Our experiments are supported by quantum-chemical calculations showing that BU6 acts as a reductant. Fiala T., Ludvíková L., Heger D., Švec J., Slanina T., Vetráková Ľ., Babiak M., Nečas M., Kulhánek P., Klán P., Šindelář V. Bambusuril as a One Electron Donor for Photoinduced Electron Transfer to Methyl Viologen in Mixed Crystals. J. Am. Chem. Soc. 2017, 139, 2597-2603. The design, synthesis, and both experimental and theoretical studies of several novel 9-(acylimino)- and 9-(sulfonylimino)pyronin derivatives containing either an oxygen or a silicon atom at position 10 are reported. 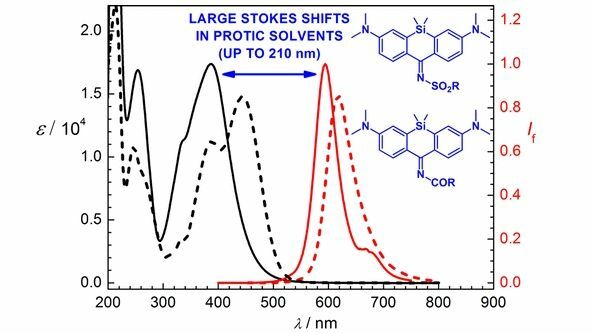 These compounds, especially the Si analogues, exhibit remarkably large Stokes shifts (around 200 nm) while still possessing a high fluorophore brightness, absorption bands in the near-UV and visible part of the spectrum, and high thermal and photochemical stabilities in protic solvents. The reason for the observed large Stokes shifts is an intramolecular charge-transfer excitation of an electron from the HOMO to the LUMO of the chromophore, accompanied by elongation of the C9–N bond and considerable solvent reorganization due to hydrogen bonding to the solvent. Due to the photophysical properties of the studied compounds and their facile and high-yielding synthesis, as well as a simple protocol for their bioorthogonal ligation to a model saccharide using a Huisgen alkyne–azide cycloaddition, they represent excellent candidates for biochemical and biological applications as fluorescent tags and indicators for multichannel imaging. Horváth P., Šebej P., Šolomek T., Klán P. Small-Molecule Fluorophores with Large Stokes Shifts: 9-Iminopyronin Analogues as Clickable Tags. J. Org. Chem. 2015, 80, 1299-1311. A combined experimental and computational approach was used to investigate the spectroscopic properties of anisole in aqueous solutions and at the ice–air interface in the temperature range of 77–298 K. The absorption, diffuse reflectance, and emission spectra of ice samples containing anisole prepared by different techniques to evaluate changes in the contaminated ice matrix that occur at different temperatures. It was found that the position of the lowest absorption band of anisole and its tail shift bathochromically by ∼4 nm in frozen samples compared to liquid aqueous solutions. On the other hand, the emission spectra of aqueous anisole solutions were found to fundamentally change upon freezing. DFT and ADC(2) calculations were used to interpret the absorption and emission spectra of anisole monomer and dimer associates. K'Ekuboni Malongwe J., Nachtigallová D., Corrochano P., Klán P. Spectroscopic Properties of Anisole at the Air-Ice Interface: A Combined Experimental-Computational Approach. Langmuir 2016, 32, 5755-5764. We designed and studied the structure, dynamics, and photochemistry of photoswitchable reverse micelles (RMs) composed of azobenzene-containing ammonium amphiphile 1 and water in chloroform at room and subzero temperatures by NMR spectroscopy and molecular dynamics simulations. The NMR and diffusion coefficient analyses showed that micelles containing either the E or Z configuration of 1 are stable at room temperature. Depending on the water-to-surfactant molar ratio, the size of the RMs remains unchanged or is slightly reduced because of the partial loss of water from the micellar cores upon extensive E → Z or Z → E photoisomerization of the azobenzene group in 1. Upon freezing at 253 or 233 K, E-1 RMs partially precipitate from the solution but are redissolved upon warming whereas Z-1 RMs remain fully dissolved at all temperatures. 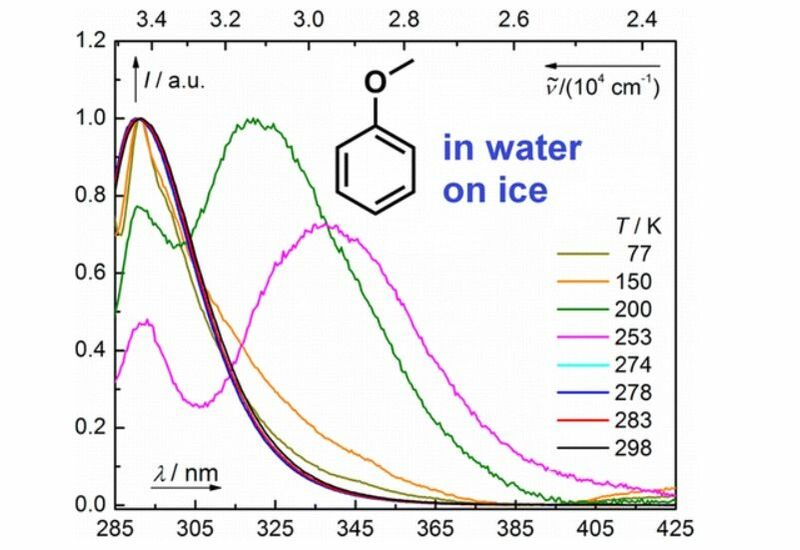 Light-induced isomerization of 1 at low temperatures does not lead to the disintegration of RMs remaining in the solution; however, its scope is influenced by a precipitation process. To obtain a deeper molecular view of RMs, their structure was characterized by MD simulations. It is shown that RMs allow for amphiphile isomerization without causing any immediate significant structural changes in the micelles. Filipová L., Kogagen M., Štacko P., Muchová E., Slavíček P., Klán P. Photoswitching of Azobenzene-Based Reverse Micelles above and at Subzero Temperatures As Studied by NMR and Molecular Dynamics Simulations. Langmuir 2017, 33, 2306-2317. The photophysical and photochemical properties of rose bengal (RB) in degassed aqueous and acetonitrile solutions were studied using steady-state and transient absorption spectroscopies. This comprehensive investigation provides detailed information about the kinetics and the optical properties of all intermediates involved: the triplet excited state and the oxidized and reduced forms of RB. A full kinetic description is used to control the concentrations of these intermediates by changing the initial experimental conditions. Ludvíková L., Friš P., Heger D., Wirz J., Šebej P., Klán P. Photochemistry of Rose Bengal in Water and Acetonitrile: A Comprehensive Kinetic Analysis. Phys. Chem. Chem. Phys. 2016, 18, 16266-16273. Photoremovable protecting groups (PPGs) are chemical auxiliaries that provide spatial and temporal control over the release of various molecules: bioagents (neurotransmitters and cell-signaling molecules, Ca2+ ions), acids, bases, oxidants, insecticides, pheromones, fragrances, etc. A major challenge for the improvement of PPGs lies in the development of organic chromophores that release the desired bioagents upon continuous irradiation at wavelengths above 650 nm, that is, in the tissue-transparent window. Understanding of the photorelease reaction mechanisms, investigated by laser flash photolysis and rationalized with the aid of quantum chemical calculations, allows for achieving this goal. Šolomek T., Wirz J., Klán P. Searching for Improved Photoreleasing Abilities of Organic Molecules. Acc. Chem. Res. 2015, 48, 3064-3072. A bioorthogonal ‘catch and photorelease’ strategy, which combines alkyne–azide cycloaddition between p-hydroxyphenacyl azide and alkyne derivatives to form a 1,2,3-triazole adduct and subsequent photochemical release of the triazole moiety via a photo-Favorskii rearrangement, is introduced. The first step can also involve photorelease of a strained alkyne and its Cu-free click reaction with azide. Madea D., Slanina T., Klán P. ‘Photorelease, Catch and Photorelease’ Strategy for Bioconjugation Utilizing p-Hydroxyphenacyl Group. Chem. Commun. 2016, 52, 12901-12904. Palao E., Slanina T., Klán P. Construction of the Carbon−Chalcogen (S, Se, Te) Bond at the 2,6-Positions of BODIPY via Stille Cross-Coupling Reaction. Chem. Commun. 2016, 52, 11951-11954. Photochemical generation of dibenzosilacyclohept-4-yne 3 from the corresponding cyclopropenone 1 and its copper-free click reactions are reported. Steady-state irradiation, kinetic, and transient absorption spectroscopy studies revealed that strained alkyne 3 is rapidly (<5 ns) and efficiently (Φ = 0.58–0.71) photoreleased from 1 and undergoes remarkably fast, selective, and high-yielding 1,3-dipolar cycloaddition with benzyl azide (∼20 M–1 s–1) or [4 + 2] inverse-electron-demand Diels–Alder reaction with 1,2,4,5-tetrazines (∼260 M–1 s–1) in both methanol and acetonitrile. Martínek M., Filipová L., Galeta J., Ludvíková L., Klán P. Photochemical Formation of Dibenzosilacyclohept-4-yne for Cu-Free Click Chemistry with Azides and 1,2,4,5-Tetrazines. Org. Lett. 2016, 18, 4892-4895. The syntheses and biological applications of two novel fluorescent 9-phenylethynylpyronin analogues containing either carbon or silicon at the position 10 are reported. Both fluorescent probes exhibited a relatively strong fluorescence in methanol and phosphate buffer saline in the near-infrared region (705–738 nm) upon irradiation of either of their absorption maxima in the blue and red regions. 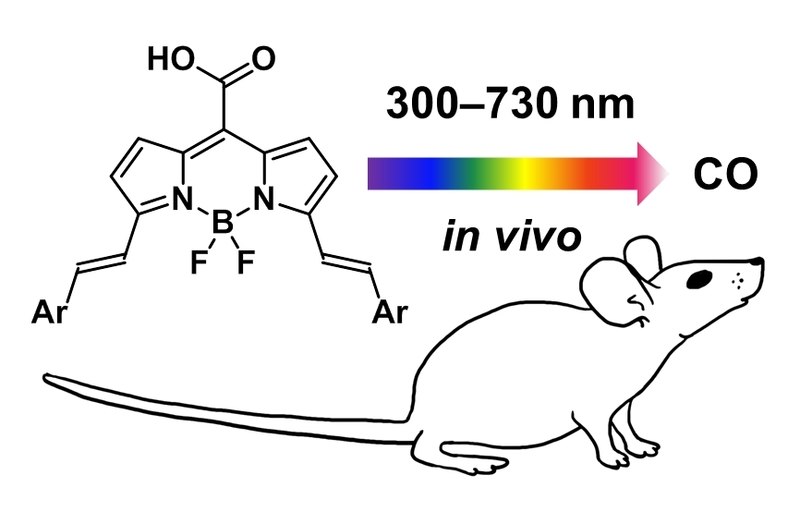 The compounds showed high selectivity toward mitochondria in myeloma cells in vivo and allowed their visualization in a favored tissue-transparent window, which makes them promising NIR fluorescent tags for applications in bioimaging. Pastierik T., Šebej P., Medalová J., Štacko P., Klán P. Near-Infrared Fluorescent 9-Phenylethynylpyronin Analogues for Bioimaging. J. Org. Chem. 2014, 79, 3374-3382.